I am writing to you, fathers, because you have come to know the One who is from the beginning. I am writing to you, young men, because you have had victory over the evil one. I have written to you, children, because you have come to know the Father. I have written to you, fathers, because you have come to know the One who is from the beginning. I have written to you, young men, because you are strong, God’s word remains in you, and you have had victory over the evil one. This is a follow-up to my recent post, Why Men Hate Going To Church (notes from David Murrow). After that post of notes from what I heard David say, the question was, "What do men want or like and what would make them stay in church?" This list is the answer. David has a quiz or survey on his website, to determine how 'man friendly' your church is. An extremely manly church might not be enjoyable for many women or for men who are not jocks, hunters, handy with tools or Nascar fans; to name just a few examples. But the point made by David is that many of our churches or much of our church culture, in how we function and what we do as the church together, has somehow turned off men, to a large extent. David's thesis is that if you build a church that is man friendly, masculine or manly; a church that men will come to, then the women will be happy and happily come to that church as well. Men who become Christians and grow in Christ is a good thing for society. Today, a higher percentage of men have given up on gathering with the church than women have. Just visit churches and see. And yes, there are some exceptions. I took David's 50 question survey and these are my answers, from being involved in the church in America. My answers are my opinion of what I would want and what I have heard from my male friends and from what I have observed in church life. Women want many and even all of these things too, and an irony is that many churches, run by mostly men, do not offer the things on this list. Men want a man in the parking lot or near the door welcoming him. Men want Signage: restrooms, parking, sanctuary, classroom, etc. Men want Facilities that are in good to great shape (not falling apart). Men want a Sanctuary not decorated femininely with quilts, feathers, pastels. Men want Men on the stage, if you have a stage, 80-100% men is ideal, but at least over 50%. Men want A "buzz" of excitement feeling in the room when they walk into a church, not the feel of a funeral parlor. Men want good, or very good musicianship, if there is music. Men don't want to hear someone sing off key or constantly play an instrument poorly. Men want less "baby love", "romancing Jesus", "Jesus is my boyfriend" songs. Men don't want songs where the chorus is repeated more than 3 times. Men want sermons that are 15 minutes max and up to only 30 min on extraordinary occasions, unless the speaker is an outstanding orator or very funny. Men want (physical) objects inserted into sermons or teaching times and/or film clips to make the point. Words up on the screen or power point presentations don't count. Men want masculine metaphors or illustrations given in sermons (battle, sports, adventure, survival). Men are not comfortable or into "prayer requests" being shared during worship services. Sharing a crisis request is fine or allowing people to go forward and privately share a request with a prayer minister is fine. But men are turned off by a bulletin handed out each week that has a full page in small type of prayer requests from members, members families, friends, neighbors and sometimes former members. Men don't want to see the children perform in front every week. Men love kids, but prefer that kids performances are once in a while. Men are fine with children helping lead worship or singing solos. If the church is a family style worship church, men are fine with children participating 100%, but it is the performances by the kids that men would like to be kept to a minimum (less is more). Men prefer worship services that last 60 minutes or less. Men are fine if there is a set coffee time before the service or something after the service (meal, food, coffee, a place to talk). Most men do not say that they wished the sermon had been longer, but shorter. Men want to get up and move. Men like to laugh and want to be able to laugh at least a couple of times a week at church. The more funny and the more laughter, the better, for men. Men like a good joke or a funny story told that makes a point. Most men prefer racial diversity in a church. The more diversity the better. Most men do not want to be encouraged or pressured to hug or hold hands with others except rarely. Men want to be at a quality event/service. They want time well spent and want to say, "well done", not "amateur hour". Men would like something unexpected to happen at church, even something so unusual that it is shocking or startling. A church where there is nearly never anything startling or shocking is extremely boring to men. Men like excitement, things that are thrilling (shocking or startling). Men like to be surprised and have things be different from week to week. Most men do not want to be at an emotional event/service where it is routine for people to weep, faint and holler emotionally. Authentic emotions like getting choked up when speaking about something sad, is liked by men though. If your church has sermons, men want astonishing and challenging sermons, not boring, irrelevant, check-your-watch-is-he-done-yet sermons. Men say that if you don't have much to say that is compelling, then be honest and say you don't have anything and give the mic to someone who does or keep it real short. Men want pastors who are manly or jock-like, not Mr Rogers-like; not effeminate. Same thing, if there is a worship or song leader: manly, jock-like, not effeminate. For "men's ministry", men want to meet other men. Men only want once a week or monthly gatherings or yearly retreats if they are for the purpose of and are vehicles for meeting and knowing other men as brothers, so that small groups, or twos, threes, fours and fives can be formed. Larger men's gatherings where men do not make friends, find a sponsor or a mentor are missing it. Men want a church where over 40% of the men are involved in men's ministry, if they have a men's ministry. If less than 40% of the men join in, then the ones who come ask where are the other men and ask what is wrong and want to have something done to attract more men. Men want a church where over 50% of the leaders in all areas are men. If you have 40, 30, 20 or 10% male leaders, you will not attract men and your church is in decline or will never grow. Men want to be led by 50% or more males in the leadership of a church, plain and simple. This is not a threatening thing to women leaders, but is just how men are wired. If you have a church where the men simply are not stepping up and being in leadership roles, then that is a church that is not going to draw the majority of men. Men want to be in a church where over 50%, preferably over 60% of volunteers are men. If you have a mid-week service or event, men want to see 50% or more males there. If the church has a staff, men want to see a staff that is 50% or more male. If there is a men's ministry, men want to see the pastor there always, often or sometimes, if he is super busy. Men want Children's Sunday School, if you have that, to be active learning and not a classroom lecture. If you have a youth group (Jr or Sr High) with a worship time, men want it to be kept short: 5 to 15 min at the longest. We have over emphasized singing and worship to the detriment of our other priorities. Men don't want small groups where there is a lot of looking up passages and reading them aloud times. This is fine in moderation but a man does not want to do this all the time in small group. Men prefer a take charge leader, even one they can disagree with, rather than a soft and gentle man, who seems lost and can't ask for directions. If your church calls a meeting, men want that meeting to have a purpose and reason or goal that is stated. How many "very important" meetings have churches called that turned out to be something we already knew or heard last time? Men are turned off by this. Men want to be a part of a church that is known or tries and wants to be known in the community. Men want to be at a church that "makes the news" with something that is going on there, with the larger community, at least once a year. Men want to join a church that often or always takes risks, does risky things. Men want a church that men who are unmarried or don't come with a girlfriend or sister would visit and check out. Men's ministries or ministries that use men's talents that men want in churches are car repair, home repair, strategic planning, financial management, and goal setting. Men want a church that is 50% or more male. Men like bigger (mega) churches. Micro churches have a greater challenge to get men to come and stay, and must ask themselves, "Is this a ladies tea, Bible study or prayer group, that we are expecting the men to join; or do we want a church that men would want to be a part of?" Men don't want someone up front leading singing or being a soloist who is a bad singer. Men prefer conservative theology. This might offend liberal or progressive Christians, but it is true. Think Orthodox when you see 'conservative' and not Fundamentalist (bigot). Men prefer casual or anything within reason and good taste, for Sunday dress. Casual jeans and t-shirts over dress up. Men want leaders who delegate responsibilities to others and share responsibilities and do not like a one-man-does-it-all style of leader that is like a dictator. Men like take charge leaders who are great at delegating and sharing the work and the responsibility and then the rewards and fruit. If a church's particular ministry program is outdated, poorly run or not producing much fruit, most men would say kill that program. Men want a pastor or preacher who often, even every week, says controversial things, taking a stand that might offend some people. 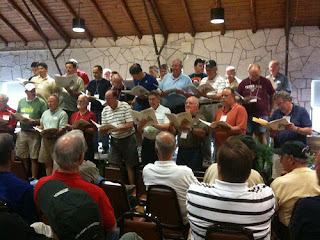 Men want congregational life to happen outdoors often or even all of the time and not once a year. Men like having church outside, in the open air.